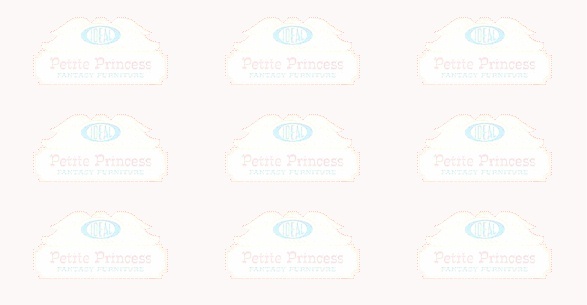 The manufacturer of the Petite Princess Fantasy Furniture line was Ideal, which is short for the Ideal Toy and Novelty Corporation. It reportedly went into business in 1907 in Brooklyn, New York. In the “Petite Princess” line, the company sold groups of furniture that were often very stylish and indicative of the time in which they were made. All furniture was hand painted and hand tailored. Special attention was given to detail with an “antique look” which was indicative of the 1960’s. 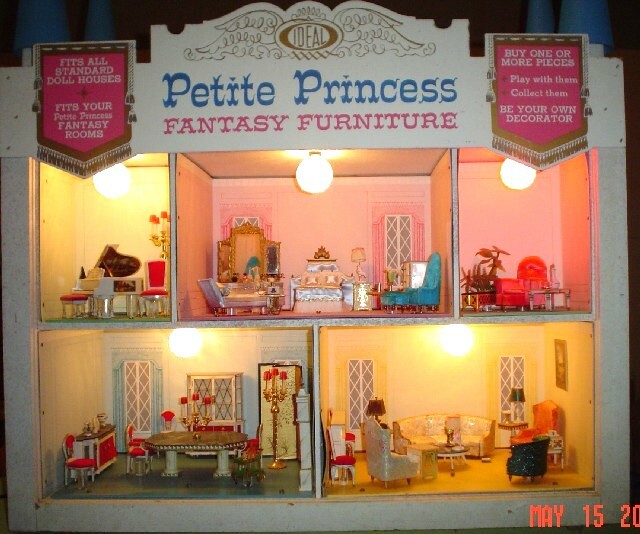 As explained in their 1964 black and white Petite Princess brochure, “Petite Princess Fantasy Furniture is hand crafted of satins, brocades, porcelain, brass, glass mirrors, and other fine materials. You will find soft, plush chairs and sofas, gilt-edged mirrors, dressers and cabinets with drawers and doors that really open and close. Everything you can dream of. Perfectly made, so you can play with it, collect it, and be the perfect Petite Princess." Ideal’s Petite Princess Fantasy Furniture first appeared in the Sears Christmas Wish Book in 1964. They offered the originally boxed thirty main pieces that I have listed in my What’s In The House section as well as the original Fantasy Family (father, mother, sister, and brother) and their Fantasy Rooms (available in pink, blue, and yellow.) Some of these pieces returned in 1966, 1967, 1968, and 1969 Sears Christmas Wish Books. 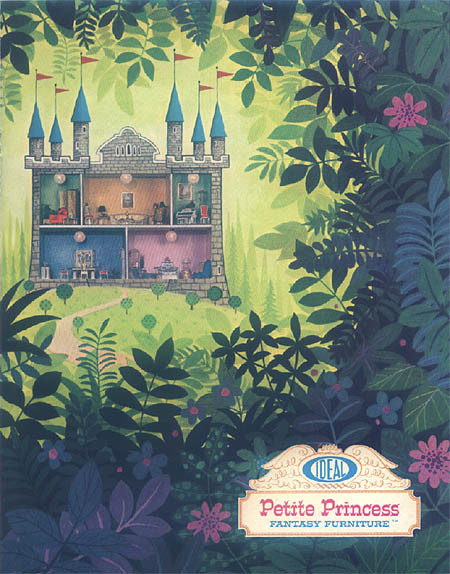 However, neither the name Ideal nor Petite Princess were featured in their Christmas catalogs with their furniture, possibly because Ideal had produced their less expensive Princess Patti line in 1965. The Princess Patti house featured the same furniture in four of the rooms- a bedroom, living room, music room, and dining room, and furnished two additional rooms- a bathroom and a kitchen. In 1966 and 1967 twenty of the original thirty pieces of furniture were offered in red roofed vinyl colonial dollhouses that could only be purchased at Sears. These pieces included the dressing table and stool, bed, lyre table and lamp, piano and bench, treasure trove cabinet, guest chairs, occasional chair with ottoman, sofa, tier table and lamp, and occasional table set. A different family than the original Fantasy Family came with this furniture. Similarly, in 1968 and 1969 Sears sold thirteen pieces of the original collection in orange-roofed colonial mansion dollhouses. Included in these mansions were the dressing table and stool, bed, tier table with lamp, host chairs, sofa, salon wing chair, occasional table set, and a new bathroom set with a bathroom tub, stool, and towel rack. The original fantasy family didn’t return this year either and was replaced by a different family again. Petite Princess vintage miniatures were produced in ¾ inch scale (.75 inches=1 foot) and no currently manufactured miniatures use this scale. This adds to the uniqueness of this product. The manufacturers of this beautiful furniture line describe Petite Princess furniture as “The fulfillment of every girl’s dream.” Ideal explains, “Here, at last are beautifully detailed, hand crafted furniture and accessories to fill many hours of fanciful play. Collect it- play with it- make room arrangements to capture the fancy of any Petite Princess. This store display (with furniture as shown) was sold recently for an astonishing $500! It was originally-designed to resemble a castle with four blue turrets, topped with colorful flags. This open-sided display (with protective Plexiglas front) was used to sell the original 30-piece set of Petite Princess Fantasy Furniture. Click on the photo above to see an enlarged view of how the individual pieces of furniture were displayed.